I wish I had taken this. Thanks Wikipedia. Blue Brick posted a beautiful series of bird photographs. She described them as elusive. I recalled a chance encounter with a least bittern and was reminded just how elusive our fine, feathered friends can be. 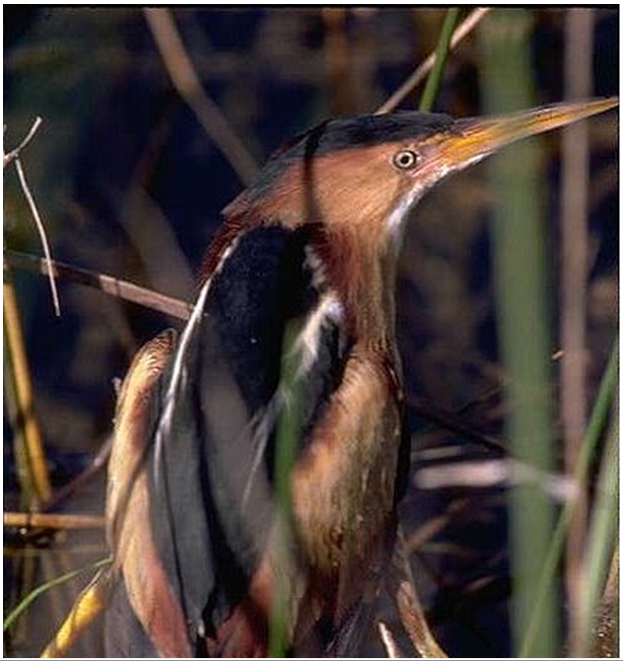 The Least Bittern is native to large marches in the Americas. They are not uncommon in the swamps that define much of the gulf coast, yet I was seventeen before I saw my first one. Now I am nearly thirty and have yet to see another of these small wonders. I am starting to doubt that any known species is more elusive. Not wanting to play “Poke the Maggot Infested Carcass With a Stick” (I was about to eat lunch.) I declined the invitation, only to be assured that the creature was still alive. Thinking it might be injured, I followed her to the back yard of one of her friends. A folded lawn chair rested against the brick wall of the house. Perched atop this lawn chair was something that must have come from outer space. Viewed from the side it was a tiny stork, some seven inches tall. Viewed from the front it was a straight line. None of the pictures I have found of this bird seem to properly illustrate its vanishing act. As I circled the little bird, its eyes never left mine. 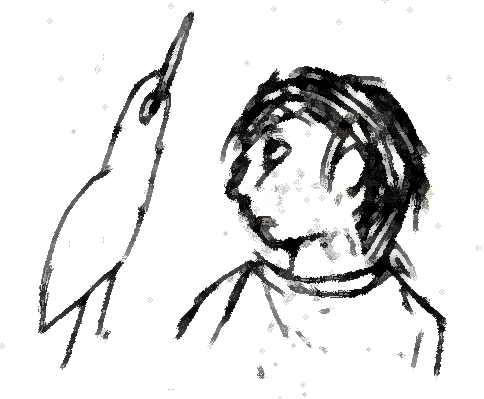 Though its beak was pointed skyward. This gave it the appearance of a thin little man with a pointed hat. It would reposition itself so I was always looking at its less visible front, perhaps, a survival strategy. We all had a staring contest with it until we were forced to blink and, just like that, it was gone. I later found the name of the bird but no picture has ever done it justice. Descriptions of its behavior though, make me certain that it was a least bittern. Many color morphs exist, much like humans I suppose, and not all of these morphs are known. This bittern spends most of its life standing perfectly still, snapping up any flying bug that wanders too close. It hides in tall masses of reeds, pretending to be a grass leaf. It hunts and breeds in these reeds, likely never emerging unless the reeds are disturbed. Despite all I have learned, it’s still hard to believe these birds are not magic. I feel like I have seen a yeti. This entry was posted in Short Stories and tagged Least Bittern. it must have been a wonderful thing to behold! wow! i have read about such insects not birds or beasts. Insects? I wonder what those Insects are? i have seen pictures in timelife magazine, in posts about camouflage, mimicry etc. there was a green insect that looked just like a leaf, and was flat like one too. i think the name of that timelife book was mimicry and adaptation. i remember the picture of that green insect only, it really looked like a leaf. Mom was shocked when it started moving I remember. still. There was no way to tell is wasen’t a leaf. Your sketches? Wow, this would make a great illustrated story! I always think of illustrated stories as a series of black and white sketches and a few more detailed full-color graphics. Still, you captured the nature of the bird better than the photo and your story is wonderful. Great potential! you are really humble about your sketches, you are a very gifted artist. My neighbor found a family of stick bugs in her garden. A whole family of them. She lives right down the street. I have never, ever seen one in the wild, not ever in my whole life. Or have I? I wish I had this skill of only being seen when I want to be. Better than pure invisibility, for sure. I saw a praying mantis once, but only once. Bitterns were only in the Brittish isles. It is a marsh bird . . .